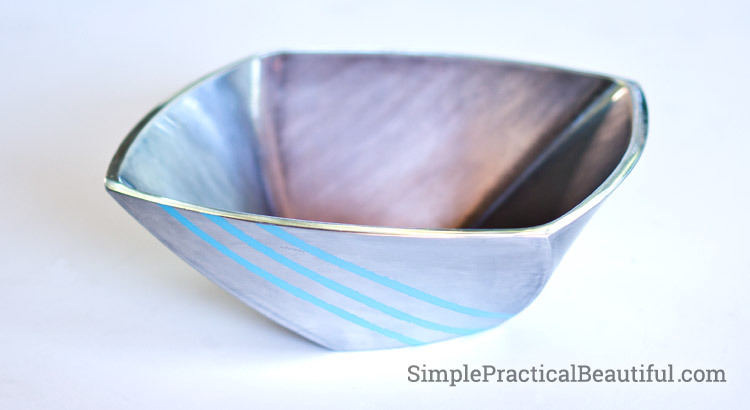 I took an old, stained metal bowl and gave it a brushed metal finish to hide the flaws and give it interest. When I got this great metal bowl second hand, I could see potential. It’s a Lenox bowl, so I knew it was good quality. And I loved the shape and design. Very simple, yet interesting, and very modern. The only issue was all the stains and what I thought was tarnish. I got the bowl just before setting our table with the winter holiday tablescape, and I thought it would be a quick job to shine it up and use it in the table decorations. Wow, was I wrong. I tried everything I could to get those stains off. I researched online and tried every metal-cleaning idea I could find. 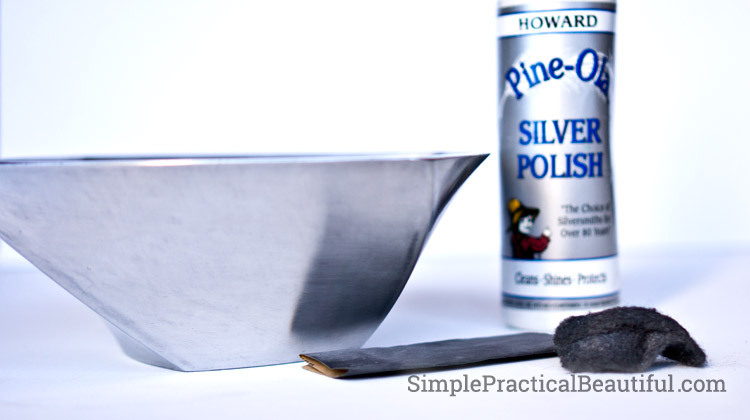 I tried silver polish, brass polish, Bar Keepers Friend, stainless steel cleaner, cream of tartar, baking soda, borax, bleach, vinegar, wood stripper, mineral spirits, and more. And no, I did not try any of these together. I would try one, give up, wait a few days or more, then try something else. I even tried polishing it with a dremel. Nothing chemical was working, so I had find something else. I love the look of brushed metal, but I figured that was just a factory finish and never tried to DIY it. Until now. I had nothing to loose with this bowl, so I pulled out some steel wool and started to rub. I rubbed following the lines of the bowl, so that the brushed metal would work with the design of the bowl. Steel wool alone was not enough. I ended up using 400 grit wet/dry sandpaper alternated with steel wool and Bar Keepers Friend, and a lot of elbow grease. (sorry, the Bar Keepers Friend didn’t get in the picture). When I had finished sanding the bowl, it looked pretty good. The only problem was that every time I touched it, I left dark fingerprint marks that did not just wipe off. That’s where the silver polish comes in. I rubbed the whole bowl down with silver polish to shine it up. I could have been finished with the brushed metal bowl then, but I wanted to add an interesting detail to it. 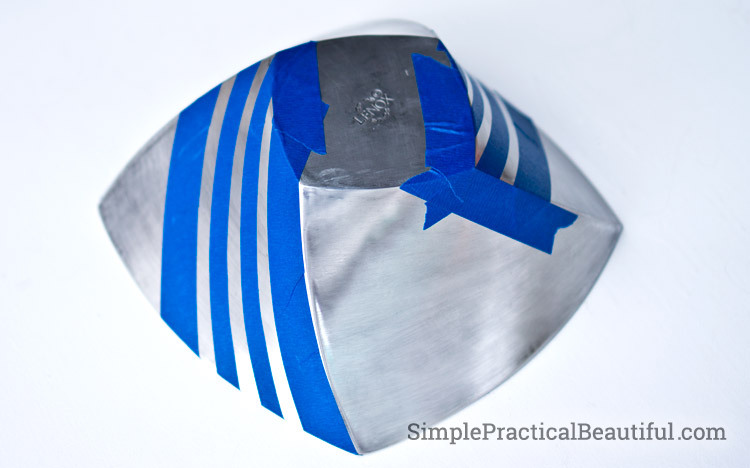 I taped off three stripes on opposite sides of the bowl. And covered the rest of the bowl with a plastic bag. Unfortunately, I should have peeled the tape off right after painting, but I waited about half an hour so the lines are a little jagged on the edges. Not what I’d planned, but I think it works with the brushed look of the bowl. Here’s the finished bowl. The brushed line from sanding follow and highlight the unusual lines of the bowl. So do the painted lines. 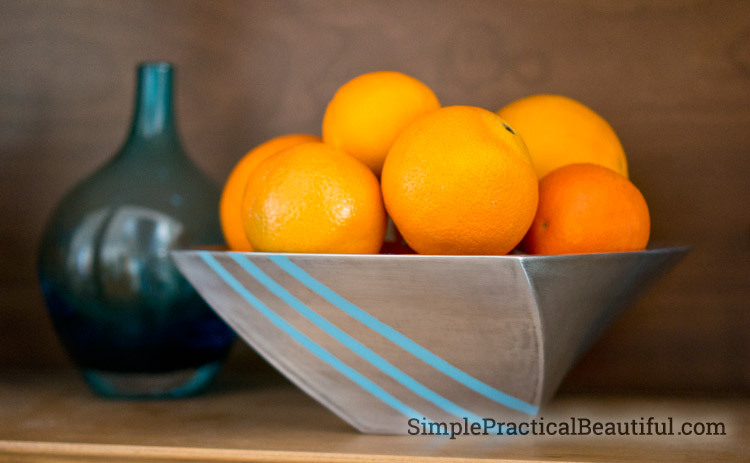 I’ve displayed the brushed metal bowl inside my china cabinet with some oranges to warm up the cold metal. And the blue goes well with some of the other blue pieces. Like this idea? Click here to subscribe to Simple Practical Beautiful to get more! 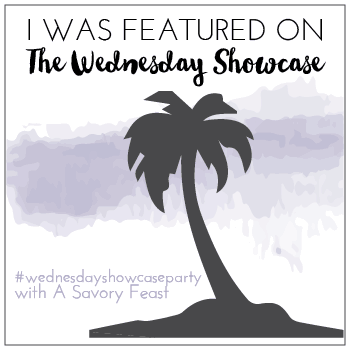 This post was shared at some of my favorite link parties, and it was featured on The Wednesday Showcase! How creative! 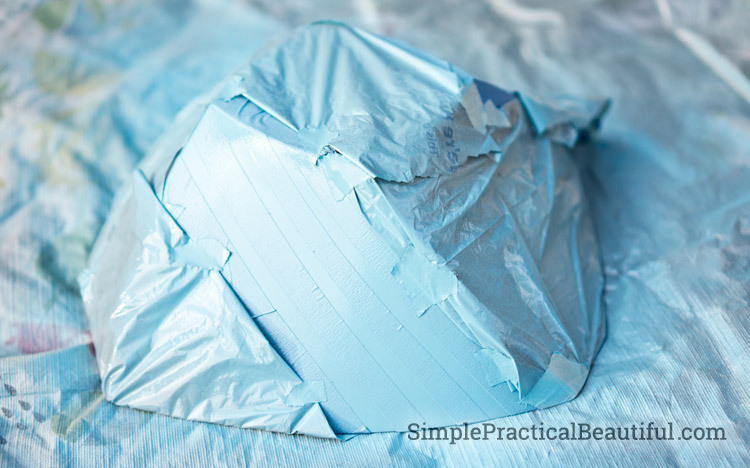 I love DIY repurposing projects, and I wouldn’t have thought to do something like this bowl. Gorgeous! Thank you, Suzette. I love repurposing projects too, taking something no longer useful and giving it new life. Although sometimes, like this bowl, it takes me a few tried to figure out how to save it. 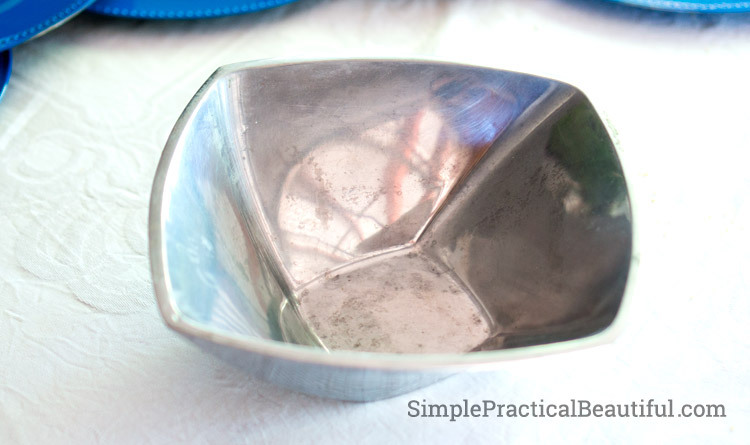 I love how you redid this metal bowl! The colors are fantastic, and the lines really draw attention to it. It turned out very nicely! Thanks, Celeste. I really liked the lines of the bowl originally, so I tried to accentuate them. I’m glad you like it. What an amazing save. You really did try everything, didn’t you? You were certainly dedicated to making sure this was a usable object. I am sure I would have given up long before you! I have pinned this to my crafty board! Thanks so much for sharing over at Celebrate Your Story! Thank you, Chloe. I did try everything! It took me months until I found a solution. I couldn’t bear to get rid of it because I really liked the shape. So it mostly just sat their while I glared at it. But, I’m happy was finally able to sand away the flaws. Love what you did to the bowl. 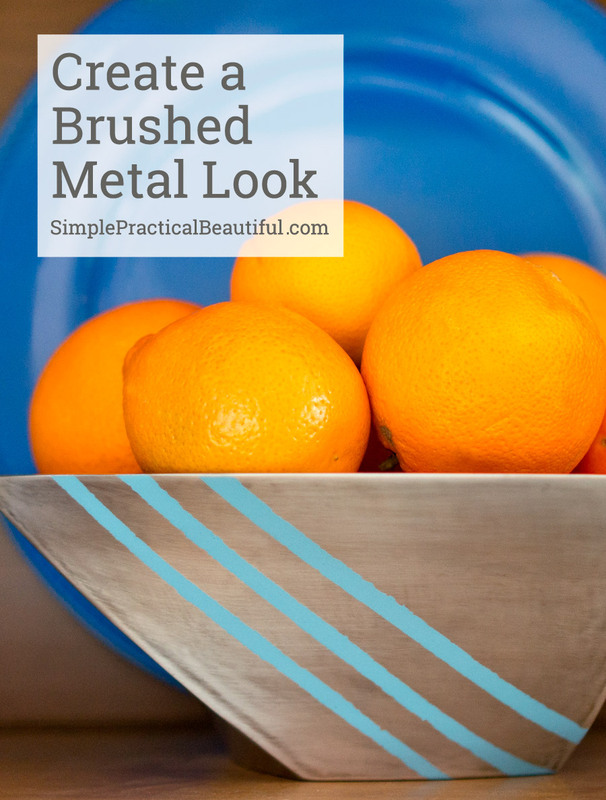 The lines and the color choice work so well with the metal bowl. Great job! Thanks, Anika. I’m really happy with the way it turned out too. So beautiful, my daughter loves doing things like this, maybe I can get her to take on a project for mr. Thanks Celeste. She just needs to find a solid metal bowl. The rest was pretty easy. Way to hang in there with a project Rebecca! I’m saving this and also sending it to my DIY daughters. Thanks for sharing this at Celebrate Your Story and have a great Valentine’s Day! Thank you, Sandra, and thanks for sharing it! I love how you revamped an old bowl! The finished project looks so spiffy! Thanks for sharing the tutorial! Stopping by from the Wednesday Showcase party. Thank you! And thanks for hosting a fun link party. This bowl looks amazing! I can’t believe you kept going and figured out how to make it beautiful again, I probably would have given up! Thanks, Kati. I’m glad I finally found something that worked! I think I would have given about about a million years before you. It looks great! He he. Thanks. I did give up, over and over. But I just loved the shape of the bowl, so I couldn’t get rid of it. I love how this turned out, Rebecca! It had great bones to start with and you gave it a fun modern twist. Thank you for sharing at the Celebrate Your Story Link Up Party! Can’t wait to see what you come up with next week. Thanks, Danielle. It was a fun bowl to work on, once I finally figured out what to do. You know what I really love (apart from the finished look which is lovely) that you didn’t give up! You knew this bowl deserved a new lease of life and you didn’t give up till you had found it. Thank you, Julie! I feel like I have a few projects like that, where I know I can make something cool, but takes a lot trial and error and a lot of time figuring it out until I get it.